Many mock the idea of planting or picking plants at a precise time or when the moon is in a certain phase. But maybe there is an element of truth within, what some would consider to be, an 'old wives tale'. 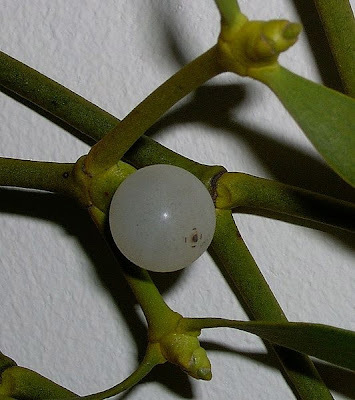 Over 2000 years ago mistletoe was described as a cure for cancer. I'm not for one minute saying it is, though Joan van Holsteijn claims the herb cured her cancer. Also note that large intakes of mistletoe can be dangerous. A cancer research institute in Switzerland, however, did some interesting experiments with mistletoe. They looked at the old cure recipes and saw that the plant had to be picked at a specific time, otherwise the effectiveness would be considerably diminished. The research institute did 70,00 experiments on parts of the plant picked at hourly intervals during the day and night. They analysed the constituents, the degree of acidity and also tested the effect of preparations on white mice (I don't agree with animal testing personally). What they discovered was that the properties of the plant were affected by the time of day, the weather and also the phases of the moon. In other words it did matter when the plant was harvested. Normally, when a so called alternative medicine is effective, it is dismissed as psychosomatic or the placebo effect. But by doing this we limit the possibilities of what might just be true. The planets affect our lives and those of the plants: the right herb or plant, picked at the right time may just be worthy of serious investigation. I've read before about how collecting plants at say a full moon is beneficiary. Never thought much more about it though. Interesting! Mistletoe as a cure for cancer? Why not? I think if you believe 100% in something, the body can heal itself. The moon affects tides, so why not plant growth?